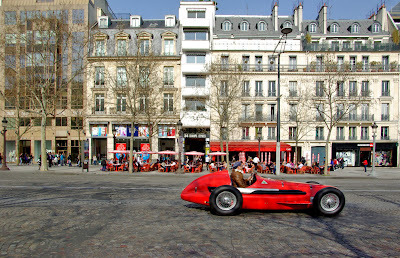 We had a beautiful day in Paris yesterday, so on the way back from a lunch in the 17th arrondissement, I decided to drive down the Champs Elysées then suddenly I saw this car my mirror... I drove as fast as I could, stopped on the lower part of the avenue and waited for it... Luckily the traffic vanished when I pressed the trigger! Et voila... Again I have no idea what this car is, but I have no doubt that, like a couple of days ago, with the Aston Martin, many of my readers will enlighten us! I don't know what the car is (except probably old) but I love the photo. The red car and the red chairs, the red awning all against the pale colored buildings really makes a nice scene. I'll be curious to see what the car is if anyone knows. No idea! What I love is that you were able to align the car with the red behind it! Brilliant. You caught a Cartier Bresson decisive moment. You might not believe how awesome this is, but you actually got a picture of an Alfa Romeo 158, the FORMULA 1 car in which Juan Manuel Fangio won the championship in 1951!!! I can't help you either...all I can say is that I love the red! Special announcement everyone: today is Petrea's birthday, we surely don't want to miss it do we?! HAPPY BIRTHDAY FROM PARIS PETREA! I must admit that I just love those old racing cars, they look great! Its an Alfa Romeo. I've owned many of these cars...but none as nice, or rare, as this one. If its red, it must be an Alpha! Lovely photo. Happy Birthday, Petrea from Northern Michigan via Paris! We have to picture Petrea parading in the A. Romeo down the Champs! Happy Birthday to you in CA from MIA via CDG. Happy birthday, Petrea! One of these years we will all get together and celebrate in Paris. Bonne Anniversaire Petrea! Remember that she was a co-organizer (with Carrie) of two PDP fan meetings in the Los Angeles area. And PHX joined us once. Sorry guys, but I reckon that's a replica kit car. I don't think you'd ever see a car as rare as that on public roads it'd be worth millions of euros. HAVE A LOVELY BIRTHDAY PETREA! Evidently it's been spotted several times driving on the streets of Paris including at night. It has headlights hidden behind the front grille for night driving and appears to have what look like little direction indicators on the front. It has been reported that the unidentified driver claims that it is not a replica but a genuine 158. My guess is that it is a replica, several details don't look quite right, it would be a pig to drive on the streets and extremely noisy if it were original. I think most of these are owned by museums or Alfa Romeo (Fangio's) and would be worth huge sums of money. Genuine or not, a really nice car. Your timing was impeccable—comme toujours, Eric. Bonne anniversaire, Petrea (you'd look great in this car)! oh!!!!!WOW!!!WOW!! 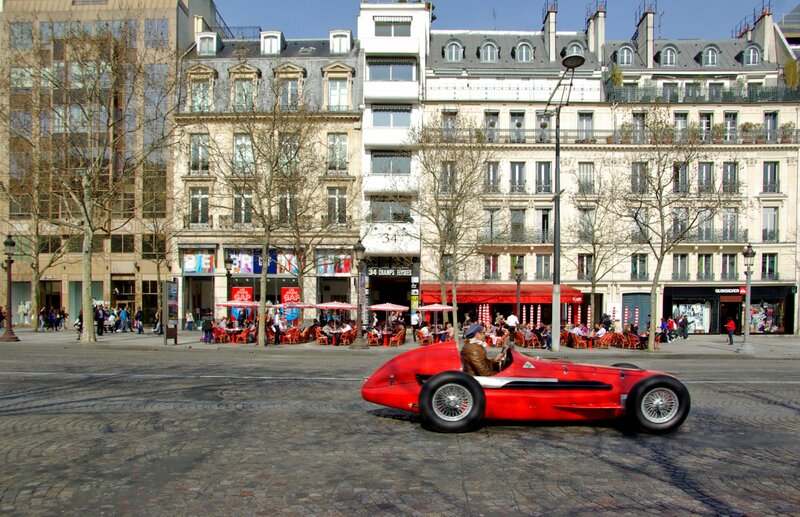 !it's an "alfetta" the 1st world formula 1 car champion by ALFA ROMEO in 1950,naturally built in milan. @Rich Painter (and all the others who think the same) "Sorry guys, but I reckon that's a replica kit car." really?! What you're saying makes sense, but this is really a surprise to me. Thanks to Drummond, we know that "it's been spotted several times driving on the streets of Paris including at night" - I did not find anything on the web about this though. If only the driver could read PDP, he could tell us! One last tiny thing. Don't misunderstand me, I don't want to sound too picky, but the correct spelling of "Happy birthday" in French is "Bon anniversaire" and not "Bonne anniversaire" as anniversaire is masculin (don't ask me why?!) which means Bon only has one "n".